Department of Microbiology, Barkatullah University, Bhopal - 462026, Madhya Pradesh, India. ABSTRACT: The aim of this study was to investigate the antidiabetic and anti-inflammatory effects of probiotic Lactobacillus paracasei MCC3195 in high fructose fed type 2 diabetic rats. High fructose diet was used to induce type 2 diabetes in male albino wistar rats. L. paracasei MCC3195 was administered to rats at a single dose of 2x108 cfu/ml per rat for 8 week. The body weight, fasting blood glucose, oral glucose tolerance test, glycosylated hemoglobin, insulin, Liver glycogen level, lipid profile and oxidative stress parameters were analyzed. Interlukin-6 and Interlukin-10 were also estimated in serum. Histopathology analysis of pancreas and liver injury were done. At 8 week body weight, FBG, glucose tolerance, HbA1c, insulin, liver glycogen level, total cholesterol, triacylglycerol, LDL-C, VLDL-C, lipid peroxidation and IL-6 were significantly increased in diabetic rats, while administration of L. paracasei MCC3195 significantly decreased these factors. The level of HDL-C, reduced glutathione, superoxide dismutase, catalase and IL-10 were significantly decreased in diabetic rats, whereas administration of L. paracasei MCC3195 significantly increased these factors. Administration of L. paracasei MCC3195 protects the Islets of langerhans and hepatic cells from destruction as compared to the diabetic rats. Probiotic L. paracasei MCC3195 exerts the antidiabetic and anti-inflamatory effect in high fructose-fed type 2 diabetic rats, by significantly improving glucose intolerance, hyperglycemia, hyperinsulinemia, dyslipidemia, oxidative stress and immunoregulatory properties as well as protects the type 2 diabetes induced complications. Further research is needed in other diabetic models for clinical application of L. paracasei MCC3195 in delay or prevention and progression of T2DM. INTRODUCTION: Diabetes mellitus is one of the most prevalent metabolic diseases in almost every country. Worldwide 90% cases were reported of type 2 diabetes mellitus and it is increasing day by day due to major changes in lifestyle such as decreased physical activity and increased cases of obesity 1. Type 2 diabetes mellitus (T2DM) is characterized by hyperglycemia, dyslipidemia, peripheral insulin resistance, impairment in insulin secretion by beta cells and β - cell failure 2. The major complication of T2DM leads to other severe clinical conditions including hypertension, increase in low-density lipoprotein cholesterol (LDL-C) and decrease in high-density lipoprotein cholesterol (HDL-C) which involve in the incidence of cardiovascular diseases 3. Life style changes that involve body weight control and obesity management can improve the glycaemic control and delay the progression of type 2 diabetes 4. Glucose homeostasis can be maintained by preserving beta cell dysfunction and insulin signaling in receptor cells of glucose 5. Oxidative stress played a major role in the onset and pathogenesis of T2DM which increase the risk of high blood pressure, insulin resistance, dyslipidemia, inflammation and other diabetic complication 6. Activation of the immune system and chronic inflammation has been involved in the pathophysiology of insulin resistance and type 2 diabetes mellitus. Rodrigues et al., reported that the IL-6 and IL-10 levels and single nucleotide polymorphisms in IL-10 gene are linked with the subclinical inflammation in the type 2 diabetes mellitus 7. Several research investigation reported that higher levels of inflammatory markers includes interleukin-6 (IL-6), C reactive protein (CRP), tumor necrosis factor-α (TNF-α) was present in T2DM patients 8. The most common oral antidiabetic agents available for diabetes treatment are sulfonylureas, biguanides, α-glucosidase inhibitors, thiazolidine-dione (TZD), meglitinide, sodium-glucose cotrans-porter (SGLT2) inhibitors and dipeptidyl peptidase 4 (DPP-4) inhibitors 9. These antidiabetic agents have high cost for treatment and their prolonged use has various side effects such as diarrhea, impaired hypoglycemia, flatulence, lactic acidosis, bloating and leads to multiple organ damage 10. Probiotic Lactic acid bacteria does not have these side effects, so they can be considered in management of T2DM. Probiotics are considered as live microorganism which exerts the health benefits to the host when consumed in adequate amount. Most of the strain of Lactic acid bacteria group have been used in human health management 11. In recent years several studies reported the potential use of probiotic lactobacilli in the management of type 2 diabetes mellitus by improving blood glucose level and lipid metabolism 12. One study found that L. rhamnosus improves the gut function by ameliorating intestinal microbial balance, oxidative stress and inflammation in high-fat diet fed rats as well as in streptozotocin treated rat 13. In a recent finding found that administration of Lactobacillius casei improves the blood glucose balance, glucose tolerance, lipid metabolism and protects islets of langerhans in the type 2 diabetic mice. The underlying mechanism behind these finding may be PI3K/Akt signalling pathway and SCFA/intestinal microbiota pathways 14. In another study they have found that L. casei improves the type 2 diabetes in mice by gut flora and GLP-1 mechanism 15. We have isolated L. paracasei MCC3195 from cheese in our lab. In our previous in-vitro study we have found that Lactobacillus paracasei MCC3195 exhibited good probiotic properties such as acid-bile salt tolerance, antimicrobial and antioxidative properties. Therefore in this in-vivo study, we investigated the antidiabetic and anti-inflammatory properties of L. paracasei MCC3195 in type 2 diabetes rats induced by high-fructose diet. Preparation of Bacterial Suspension: L. paracasei MCC3195 (Gene bank accession no.-KY392984) used in the present study were isolated from dairy sample (cheese) and characterized for their probiotic properties. L. paracasei MCC3195 were cultured in de Mann Rogosa Sharpe (MRS) broth at 37 °C in anaerobic condition. Colony counting was performed before the animal experiments begin to assess the numbers of surviving bacteria were adjusted to 2.0 x 108 CFU/ml. Bacterial dose were prepared in double distilled water (ddH2O) for oral administration to rats. The four experimental groups with six rats each were prepared as per given schedule. Oral Glucose Tolerance Test: Oral glucose tolerance tests were performed after 4 weeks on overnight fasted diabetic rats followed by an oral glucose load (2g/kg of body weight). Blood samples were collected from the tail vein of each animal just after oral glucose administration at 0, 30, 60, 90 and 120 min for the assay of glucose. Glucose concentration was measured with an Accu-Check active blood glucose meter (Roche Group, Indianapolis, IN, USA). Blood and Tissue Sample Collection: At the end of the experiments (8th week), blood samples were collected from the retro orbital puncture of 12-h fasted and anesthetized animals. A portion of whole blood samples were used for determination of glycosylated haemoglobin (HbA1c). The remaining blood samples were centrifuged at 4000 × g for 10 min at 4°C and plasma was collected to analyze insulin level. Furthermore, serum was separated and stored at −20 °C for the analysis of IL-6 and IL-10. All animals were sacrificed by under mild ether anesthesia. The whole pancreas and liver from each animal was removed after sacrificing the animal and was collected in 10% formalin solution. Determination of Fasting Blood Glucose Level, HbA1c, Insulin, Liver Glycogen and Lipid Profile: Fasting blood glucose level was measured by Accu-Check active blood glucose meter (Roche Group, Indianapolis, IN, USA). Glycosylated hemoglobin (HbA1c) was measured using Euro diagnostic system kit. Plasma insulin was determined with an Insulin Rat ELISA kit (Thermo Scientific, USA). Liver glycogen was assayed using Glycogen assay kit (Abcam, UK). Total cholesterol (TC), triacylglycerol (TG), and High-density lipoprotein cholestrol (HDL-C) levels in blood serum were determined by manufacture protocol of enzymatic kits purchased from (Span Diagnostic Reagent Kit, India). Low-density lipoprotein (LDL-C) and very low-density lipoprotein cholesterol (VLDL-C) levels in blood serum were calculated by Friedewald’s formula. Determination of Oxidative Stress Parameters in Pancreas: The activity of oxidative stress parameters were measured in pancreas. LPO was measured according to the method of Ohkawa et al., 16. Superoxide dismutase (SOD) was measured according to the method of Kakkar et al., 17. Catalase (CAT) was estimated as described by Sinha 18. Reduced glutathione (GSH) was estimated as described by Ellman19. Determination of inflammatory cytokines IL-6 and IL-10: Determination of IL-6 (Pro-inflammatory cytokines) and IL-10 (Anti-inflammatory cytokines) was done in serum sample separated from blood. Levels of Interluekin-6 and Interlukin-10 were measured according to the recommendations of the manufacturer using ELISA kits purchased from RayBio®. Histopathologic Analysis: The pancreases and liver were fixed for 48 h in 10% formalin saline and processed by the paraffin technique. Sections of 5 micron thickness were cut and stained by haematoxylin and eosin (H & E) for histological examination. Observation of slides was done under light microscope (DM2000; Leica, Bensheim, Germany). Statistical analysis: The data were analyzed by One way ANOVA followed by Bonferroni test using sigmastat32, India. p<0.05 was considered as level of significance. The resulting values were expressed as mean±standard error of the mean. Effect on Body Weight: Table 1, presents change in body weight. The food and water intakes were found to be quite same across groups (i.e., NCG, HFCG, MTHFG, and LPHFG) of rats tested. Extra energy received by HFCG, MTHFG, LPHFG in the form of high fructose diet. The body weights of all the rats rapidly increased in high fructose diet receiving groups except NCG. The one-way ANOVAs for repeated measurements revealed a significant (P < 0.05) increase in body weights of HFCG than that of NCG group while body weight gain in MTHFG and LPHFG animals was non significant than that of NCG group. Effect on Oral Glucose Tolerance Test: Fig. 1 shows the experimental results of the OGTT at week 4. Glucose tolerances were impaired at 4 week in the HFCG group. The area under the curve (AUC) glucose value in the HFCG group was significantly higher 64% than that in the NCG group (P<0.05). The AUC glucose value in the MTHFG, LPHFG group was significantly (P < 0.05) lower (58% and 56% respectively) than that in the HFCG group. Effect on Fasting Blood Glucose, Glycosylated Hemoglobin, Insulin, Liver Glycogen, Lipid Profile and Oxidative Stress Parameters: Table 2 shows that the fasting blood glucose levels in the HFCG group were significantly higher (P<0.05, 67%) than those in the NCG group it confirms the diabetic state of HFCG animals. Fasting blood glucose levels of the MTHFG and LPHFG group were significantly (P < 0.05) higher (27.20% and 40.36% respectively) as compared to normal group but significantly lower (54.42% and 44.29% respectively) than that of HFCG animals after 8 week. HbA1c levels in the HFCG group were significantly higher (P < 0.05, 45.19%) than those in the NCG group. No significant difference was observed in HbA1c level in MTHFG and significant increase (17.32%) in HbA1c level was observed in LPHFG group than that of NCG group, but significantly (P < 0.05) decrease (41.82% and 33.7% respectively) in MTHFG and LPHFG group than that of HFCG group. Liver plasma insulin significantly increased (P < 0.05, 56%) in the HFCG group as compared with NCG animals after 8 week of fructose administration; however, plasma insulin was also significantly increased (P < 0.05, 15% and 20% respectively) in the MTHFG and LPHFG than that of NCG group. Liver glycogen level were significantly increased (P < 0.05, 19.90%) in HFCG group as compared to NCG animals, however, No significant difference were found in MTHFG and LPHFG group as compared to NCG group but found to be significantly different (P < 0.05, 20.20% and 19.45% respectively) from HFCG group. There was a significant (P < 0.05) increase (18%, 35%, 32% and 34%, respectively) in the level of serum TC, TG, LDL-C and VLDL-C and significant (P < 0.05, 19%) decrease in serum HDL-C in HFCG animals as compared to NCG animals. However, significant (P < 0.05) decrease (12.60%, 26.90%, 26.43% and 28.18%, respectively) in TC, TG, LDL-C, VLDL-C and a significant increase in serum HDL-C (P < 0.05, 20.56%) was observed after L. paracasei administration in LPHFG animals than that of HFCG at 8 week. Moreover, there was a significant (P < 0.05) decrease (15.04%, 31.41%, 29.17%, 31.06%) in TC, TG, LDL-C, VLDL-C and a non significant increase in serum HDL-C (17.01%) was found in MTHFG as compared to HFCG animals. Level of LPO in pancreatic tissue was significantly increased (P < 0.05, 49.23%) in HFCG group as compared to NCG group. Administration of Metformin and L. paracasei MCC3195 significantly decreased the LPO level (P < 0.05, 39.82% and 35.66% respectively) in MTHFG and LPHFG group as compared to HFCG group. Concentration of GSH in pancreatic tissue was significantly decreased (P < 0.05, 66.45%) in HFCG group as compared to NCG group. Administration of Metformin and L. paracasei MCC3195 significantly increased the GSH concentration (P < 0.05, 60.35% and 58.66% respectively) in MTHFG and LPHFG group as compared to HFCG group. Level of SOD in pancreatic tissue was significantly decreased (P < 0.05, 52.09%) in HFCG group as compared to NCG group. Administration of Metformin and L. paracasei MCC3195 significantly increased the level of SOD (P < 0.05, 47.33% and 44.69% respectively) in MTHFG and LPHFG group as compared to HFCG group. Concentration of CAT in pancreatic tissue was significantly decreased (P < 0.05, 37.33%) in HFCG group as compared to NCG group. Administration of Metformin and L. paracasei MCC3195 significantly increased the CAT concentration (P < 0.05, 29.19% and 23.99% respectively) in MTHFG and LPHFG group as compared to HFCG group. †Significantly different from normal control group (P < 0.05). ‡ Significantly different from High fructose fed control group (P < 0.05). ** Significantly different from Metformin drug treated control group (P < 0.05). Effect on IL-6 and IL-10: Fig. 2 shows the results of Interlukin- 6 (IL-6) and Interlukin- 10 (IL-10) measurement in rats administered L. paracasei MCC3195 for 8 week. Fig. 2A shows that there was a significant (P <0.05) increase (80.64%) was found in the values of IL-6 in HFCG group than those in NCG group. However, these values were significantly (P < 0.05) decreased (69.46% and 58.69% respectively) in the MTHFG and LPHFG group compared with those in the HFCG group; moreover these values were found to be significantly (P < 0.05) increased (36.61% and 53.13% respectively) in the MTHFG and LPHFG group than those in the NCG group. No significant differences were observed in IL-6 level between the MTHFG and LPHFG groups. Fig. 2B shows that there was a significant (P < 0.05) decrease (28.73%) was found in the values of IL-10 in HFCG group than those in NCG group. However, these values were significantly (P < 0.05) increased (25.30% and 24.75% respectively) in the MTHFG and LPHFG group compared with those in the HFCG group. No significant differences were observed in IL-10 level in the MTHFG and LPHFG group than those in the NCG group; however, there is also no significant difference was found between the MTHFG and LPHFG groups. FIG. 2: THE LEVELS OF IL6 AND IL-10 IN BLOOD SERUM OF RATS ADMINISTERED LACTOBACILLUS PARACASEI MCC3195 AT 8 WEEK. (A) IL-6 (B) IL-10. IL, interleukin; NCG, Normal control group; HFCG, High fructose fed control group; MTHFG, Metformin and high fructose treated group; LPHFG, Lactobacillus paracasei MCC3195 and high fructose treated group. All groups contain six animals, values are expressed as MEAN±SEM, One way Anova followed by Bonferroni test. * Significantly different from normal control group (P < 0.05). **Significantly different from High fructose fed control group (P < 0.05). Effect on Histology of Pancreas and Liver: Fig. 3 shows the results of histology analysis of the pancreases of the four experimental groups which reveals considerable differences in the structure, number and pattern of islets of Langerhans. Fig. 3A shows the normal histological structure of rat pancreas with normal islet in normal control group (NCG). The islets cells were round or oval, elongated and evenly distributed in pancreatic acinar or cytoplasm with clear boundaries around the cells. Fig. 3B shows the histological structure of diabetic control rat pancreas in HFCG group. The islets cells cluster were found to be irregular in shape, undefined and necrosis of the cells was clearly seen. Fig. 3C shows the histological structure of rat pancreas in MTHFG group. Metformin treated rat pancreas showing good protection from HFD-induced changes in the pancreatic islets. Fig. 3D shows the histological structure of rat pancreas in LPHFG group. Probiotic Lactobacillus paracasei MCC3195 treated rat pancreas showed adequate regeneration and protection of β-cells when compared with diabetic control group (HFCG). Fig. 4 shows the results of histology analysis of the livers of the four experimental groups. Fig. 4A shows the normal histology in NCG group with a small number of cells undergoing a degenerative process. Fig. 4B shows the histological structure of diabetic control rat liver in HFCG group. 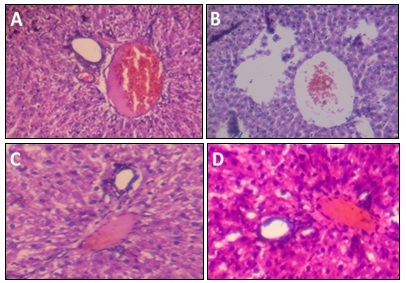 Liver of HFCG rat showing highest pathological changes like derangements of cords, vascular changes, cellular infiltration, degeneration, necrosis in cells and some hepatocytes with micro vesicular cytoplasm undergoing steatosis process. Fig. 4C shows the histological structure of rat liver in MTHFG group. Liver of metformin treated rat shows adequate protection from HFD-induced changes in the normal structure of hepatocytes. Fig (4D) shows the histological structure of rat pancreas in LPHFG group. Liver of diabetic rat treated with Probiotic Lactobacillus paracasei MCC3195 shows maximum restoration of hepatocytes and minimal necrosis with normal appearance of hepatic cells. FIG. 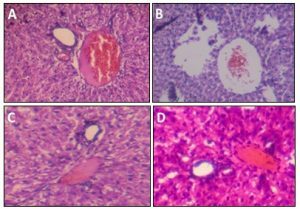 4: EFFECT ON HISTOLOGICAL CHANGES OF LIVERS IN HIGH FRUCTOSE DIET INDUCED DIABETIC RATS. 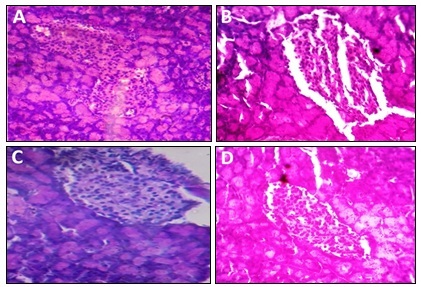 H&E STAINING OF PANCREAS WAS PERFORMED FOLLOWING 8 WEEKS OF ADMINISTRATION, MAGNIFICATIONS, X100 (A) LIVER SECTIONS OF RATS IN THE NORMAL CONTROL GROUP (NCG); (B) LIVER SECTIONS OF RATS IN THE HIGH FRUCTOSE FED CONTROL GROUP (HFCG); (C) LIVER SECTIONS OF RATS IN THE METFORMIN AND HIGH FRUCTOSE TREATED GROUP (MTHFG); (D) LIVER SECTIONS OF RATS IN THE, LACTOBACILLUS PARACASEI MCC3195 AND HIGH FRUCTOSE TREATED GROUP (LPHFG). DISCUSSION: Probiotics are known to confer the various health benefits to host when consumed in adequate amount. Various clinical conditions can be prevented and treated by lactic acid bacteria who serve as probiotics 20. Several recent studies show that Lactobacilli group exerts beneficial effect in type 2 diabetes mellitus 21, 22. L. acidophilus and L. casei contained in dahi significantly reduce the high fructose induced diabetic symptoms in wistar rats 23. In the present study we analyze the antidiabetic and anti-inflammatory effect of Lactobacilli paracasei MCC3195 in wistar rats for 8 week of experimental period. We have found that Lactobacilli paracasei MCC3195 administration prevents and delays the onset of high fructose induced type 2 diabetes in wistar rats. Body weights in various experimental groups were significantly (P <0.05) influenced by time, diet and dose of drug and bacteria. Excessive body weight gain was prevented by L. paracasei MCC3195 (LPHFG) and metformin (MTHFG) administration as compared to HFCG rats, they also prevents the symptoms of T2DM. Body weight gain in these groups was near to NCG group values at 8 week. However, few studies confirm that L. casei prevents the body weight gain in T2DM mice induced by high fat diet and streptozotocin 24, 25. Results of OGTT reveals that L. paracasei MCC3195 improves the glucose tolerance in LPHFG group while diabetic rats of HFCG group shows impaired glucose tolerance at 4 week. Lactobacillus paracasei subsp. Paracasei may protect the impaired glucose tolerance in high fat and high fructose diet induced rats through the possible mechanism of improving intestinal microbiota, preserves their gut integrity and lowers the LPS-induced inflammation 26. Elevated Fasting blood glucose is one of the important measures of T2DM condition 27. In our study, FBG was significantly increased in HFCG animals during 8 week of experimental period which is the indicative of onset of T2DM while L. paracasei MCC3195 (LPHFG) and metformin (MTHFG) administration in rats prevents the onset of T2DM and significantly decreased the FBG than that of HFCG group. FBG in these groups was near to NCG group values. This outcome reveals the antidiabetic potential of L. paracasei MCC3195 in rats. Lactobacillus gasseri BNR17 has been reported to reduces the blood glucose level in db/db mice with T2DM 28. Consumption of probiotics in the adequate amount improves the glucose metabolism within the 8 week of experimental period 29. HbA1c is one of the very common measures of glycemia in T2DM. HbA1c indicates the no. of glucose molecules binds with the heamoglobin in RBC which provide average blood glucose level of individual of about preceding two-three months. This glycated heamoglobin is considered as important marker to test T2DM 30. HbA1c was significantly increased in HFCG animals during 8 week experiment which is may be due to increase in blood glucose level of rats while L. paracasei MCC3195 (LPHFG) and metformin (MTHFG) administration in rats prevents the rising of HbA1c indicates reduction of blood glucose level for a larger period. L. paracasei MCC3195 found to significantly (P < 0.05) reduce the HbA1c level in high fructose induced rats. Yadav et al., reported that dahi containing L. acidophilus and L. casei significantly reduce the HbA1c in high fructose induced type 2 diabetic rats 31. Insulin is a major hormone that plays a key role in glucose metabolism. Insulin resistance developed due to presence of high amount of lipid in fat deposit tissue namely adipose tissue and their constant release in blood plasma after metabolism. Insulin receptor become resist of insulin due to this condition. In this study high fructose diet induced insulin insensitivity significantly improved by L. paracasei MCC3195 and metformin in LPHFG group and MTHFG group respectively. Probiotics such as L. rhamnosus, L. acidophilus and Bifidobacterium bifidum also reported to improve insulin resistance in high fat diet induced mice 32. The liver plays an important role in managing blood glucose homeostasis, by converting high amount of blood glucose into glycogen 33. In the present study, Glycogen level were increased in HFCG group due to high fructose diet. Usually hepatic glycogen is favorable to body but extra sugar releases bad cholesterol which may lead to diabetic dyslipidemia. Administration of L. paracasei MCC3195 decrease the glycogen accumulation in LPHFG group as compared to HFCG group. Dyslipidemia is very common condition in type 2 diabetic patient it can be major source of cardiovascular disease in diabetic individuals 34. In this study we have found that the concentration of serum TC, TG, LDL-C and VLDL-C was significantly (P <0.05) high and HDL-C concentration was significantly (P <0.05) low in HFCG animals as compared to NCG animals. However, significant (P < 0.05) decrease in the level of TC, TG, LDL-C, VLDL-C and a significant increase in serum HDL-C (P <0.05) level were observed in LPHFG animals after L. paracasei administration than that of HFCG group. Moreover, there was a significant (P <0.05) decrease in TC, TG, LDL-C, VLDL-C and a non significant increase in serum HDL-C was found in MTHFG as compared to HFCG animals. Various mechanisms are involved in lowering the cholesterol level by probiotics such as reduction in cholesterol assimilation and absorption by intestine 35. Higher amount of blood glucose may lead to Caridiovascular disease and impair the antioxidant system in type 2 diabetic condition. Oxidative stress may induce cellular damage and increases the diabetic complication. Lipid peroxidation and their by product such as malondialdehyde (MDA) increased in type 2 diabetes mellitus (T2DM) 36. In the present study Administration of L. paracasei MCC3195 significantly decreased the LPO level (P < 0.05) in LPHFG group as compared to HFCG group. The concentration of GSH, SOD and CAT were significantly increased (P < 0.05) in LPHFG group as compared to HFCG group which shows the excellent antioxidative property of L. paracasei MCC3195 in pancreas. Inflammatory markers such as IL-6 and IL-10 are the major factor in the development of T2DM. IL-6 is a pro inflammatory cytokine and their elevated level is significantly linked with higher risk of type 2 diabetes 37. We have found the significant (P < 0.05) increase in the level of IL-6 in diabetic rats as compared normal rats. However, there was significant (P < 0.05) decreased of IL-6 level in the LPHFG group after administration of L. paracasei MCC3195. IL-6 level was also decreased in MTHFG group after administration of metformin. L. paracasei MCC3195 and metformin both are involved in the lowering of IL-6 level. IL-10 belongs to an anti-inflammatory cytokine that are involved in the lower production of inflammatory cytokine and inhibition of antigen presentation to MHC cells 38. We have found the significant (P < 0.05) decrease in the level of IL-10 in diabetic rats as compared normal rats. However, there was significant (P < 0.05) increase in the level of IL-10 level in the LPHFG group after administration of L. paracasei MCC3195. IL-10 level was also increased in MTHFG group after administration of metformin. L. paracasei MCC3195 and metformin both are involved in the increase of IL-10 level. IL-10 increases the insulin sensitivity in skeletal muscle and involved in the treatment of type 2 diabetes induced by high fat diet 39. It has been suggested that the antidiabetic effect of L. paracasei MCC3195 may be a character of its immunoregulatory attribute. Histological analysis of pancreas and liver also reveals the protective effect of islet of langerhans and hepatic cell respectively by L. paracasei MCC3195 in type 2 diabetic rats. CONCLUSION: The results of this study demonstrates that Lactobacillus paracasei MCC3195 administration in high fructose induced type 2 diabetic Wistar rats significantly protect and improves the glucose intolerance, hyperglycemia, hyperinsulinemia, dyslipidema, oxidative stress and ameliorates the IL-6 and IL-10 levels. 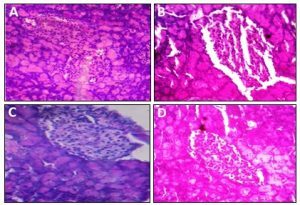 Histopathological analysis of pancreas and liver confirms the protective effect L. paracasei MCC3195 in type 2 diabetic rats. Lactobacillus paracasei MCC3195 exerts the antidiabetic, antioxidative and anti-inflammatory effect in high fructose fed type 2 diabetic rats and protects the diabetes induced complication. These results supported that Lactobacillus paracasei MCC3195 can be used for the prevention and delay the onset of T2DM. It can also be used as functional food to manage T2DM. Few more studies are required to determine these activities in other diabetic model for the clinical application of this bacterium in the management of type 2 diabetes. AKNOWLEDGEMENT: Bharti Mahajan is thankful to the Council of Scientific and Industrial Research (CSIR), New Delhi, India, for providing financial support under Junior Research Fellowship Ref. No. 09/373(0386)/2016-EMR-I. The authors are grateful to Dr. Anil Prakash, Professor, Department of Microbiology, Barkatullah University, Bhopal for his constant support in research work. CONFLICT OF INTEREST: There is no any conflict of interest. World Health Organization (WHO). Global Report on Diabetes. Geneva, Switzerland; 2016. Reaven GM: Role of insulin resistance in human disease. Banting lecture, Diabetes 1988; 37:1595. Huang D, Refaat M, Mohammedi K, Jayyousi A, Al-Suwaidi J and Abi-Khalil C: Macrovascular Complications in Patients with Diabetes and Prediabetes. BioMed Research International 2017; 7839101. Annick V, Hartstra, Kristien EC, Bouter, Bäckhed F and Nieuwdorp M: Insights into the Role of the Microbiome in Obesity and Type 2 Diabetes. Diabetes Care 2015; 38(1): 159-165. Cerf ME: Beta Cell Dysfunction and Insulin Resistance. Frontiers in Endocrinology 2013; 4: 37. Das P, Biswas S, Mukherjee S and Bandyopadhyay SK: Association of Oxidative Stress and Obesity with Insulin Resistance in Type 2 Diabetes Mellitus. Mymensingh Medical Journal 2016; 25(1): 148-52. Rodrigues, Fontana K, Pietrani, Teixeira N, Bosco, Aparecida A, Campos, Freire FM, Cristina SV, Gomes and Braga K: IL-6, TNF-α, and IL-10 levels/polymorphisms and their association with type 2 diabetes mellitus and obesity in Brazilian individuals. Archives of Endocrinology and Metabolism 2017; 61: 438-446. Pradhan AD, Manson JE, Rifai N, Buring JE and Ridker PM: C-reactive protein, interleukin 6, and risk of developing type 2 diabetes mellitus. JAMA 2001; 286: 327-34. Campbell I: Oral antidiabetic drugs: their properties and recommended use. Prescriber 2007; 18: 56-74. Mahajan B, Sohuche YS, Hayes J, Marotta F, Yadav H and Singh V: MALDI-TOF MS spectrophotometric and 16S rRNA gene sequencing identification of probiotic lactic acid bacteria isolated from dairy food products. International Journal of Probiotics and Prebiotics 2017; 12: 199-210. Hu YM, Zhou F, Yuan Y and Xu YC: Effects of probiotics supplement in patients with type 2 diabetes mellitus: A meta-analysis of randomized trials. Medicina Clínica 2017; 148: 362-370. Singh S, Sharma R, Malhotra S, Pothuraju R and Shandilya U: Lactobacillus rhamnosus NCDC17 ameliorates type-2 diabetes by improving gut function, oxidative stress and inflammation in high-fat-diet fed and streptozotocin treated rats. Beneficial Microbes2016; 10: 3920. Li X, Wang E, Yin B, Fang D, Chen P, Wang G, Zhao J, Zhang H and Chen W: Effects of Lactobacillus casei CCFM419 on insulin resistance and gut microbiota in type 2 diabetic mice. Beneficial Microbes 2017; 8: 421–432. Wang G, Li X, Zhao J, Zhang H and Chen W: Lactobacillus casei CCFM419 attenuates type 2 diabetes via a gut microbiota dependent mechanism. Food and Function 2017; 8: 3155-3164. Ohkawa H, Ohishi N and Yagi K; Assay for lipid peroxides in animal tissues by thiobarbituric acid reaction. Analytical Biochemistry 1979; 95: 351-8. Kakkar P, Das B and Viswanathan PN: A modified spectrophotometric assay of superoxide dismutase. Indian Journal of Biochemistry and Biophysics 1984; 21: 130-2. Sinha AK: Colorimetric assay of catalase. Analytical Biochemistry 1972; 47: 389-94. Ellman GL: Tissue sulfhydryl groups. Archives of Biochemistry and Biophysics 1959; 82: 70 -7. Mahajan B and Singh V: Recent Trends in Probiotics and Health Management: A Review. International Journal of Pharmaceutical Sciences and Research 2014; 5: 1643-52. Mazloom Z, Yousefinejad A and Dabbaghmanesh MH: Effect of Probiotics on Lipid Profile, Glycemic Control, Insulin Action, Oxidative Stress, and Inflammatory Markers in Patients with Type 2Diabetes: A Clinical Trial. Iranian Journal of Medical Sciences 2013; 38:38-43. 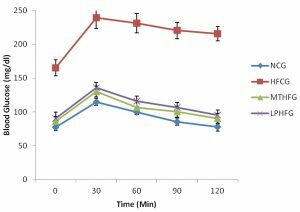 Sharma P, Bhardwaj P and Singh R: Administration of Lactobacillus caseiand B. bifidum Ameliorated Hyperglycemia, Dyslipidemia, and Oxidative Stress in Diabetic Rats. International Journal of Preventive Medicine 2016; 7:102. Yadav H, Jain S and Sinha PR: Antidiabetic effect of probiotic dahi containing Lactobacillus acidophilus and Lactobacillus casei in high fructose fed rats. Nutrition 2007; 23:62-8. 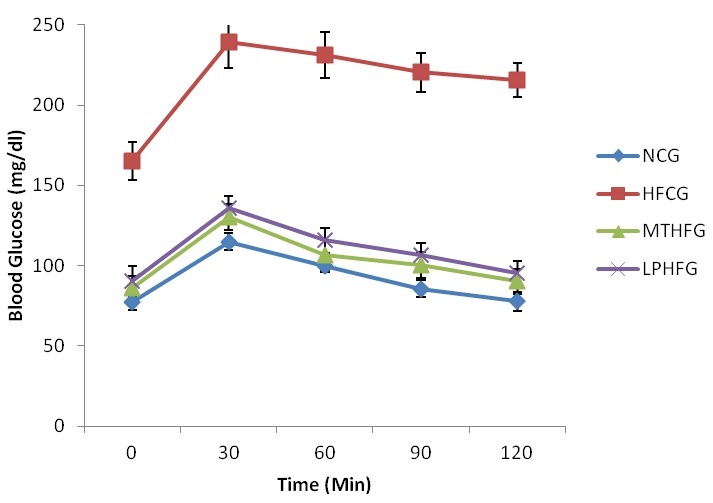 Chen P, Zhang Q, Dang H, Liu X, Tian F, Zhao J, Chen Y, Zhang H and Chen W: Antidiabetic effect ofLactobacillus casei CCFM0412 on mice with type 2 diabetes induced by a high-fat diet and streptozotocin. Nutrition 2014; 30: 1061 -1068. Matsuzaki T, Yamazaki R, Hashimoto S and Yokokura T: Antidiabetic effects of an oral administration of Lactobacillus casei in a non-insulin-dependent diabetes mellitus (NIDDM) model using KK-AY mice. Endocrine Journal 1997; 44: 357-65. Hung SC, Tseng WT and Pan TM: Lactobacillus paracasei paracasei NTU 101 ameliorates impaired glucose tolerance induced by a high-fat, high-fructose diet in Sprague-Dawley rats. Journal of Functional Foods 2016; 24: 472-481. Li F, Fu L, Zhang W, Su X, Wu J and Sun J: Blood Glucose Fluctuations in Type 2 Diabetes Patients Treated with Multiple Daily Injections. Journal of Diabetes Research 2016; 1028945. Yun SI, Park HO and Kang JH: Effect of Lactobacillus gasseriBNR17 on blood glucose levels and body weight in a mouse model of type 2 diabetes. Journal of Applied Microbiology 2009; 107: 1681-1686. Zhang Q, Wu Y and Fei X: Effect of probiotics on glucose metabolism in patients with type 2 diabetes mellitus: A meta-analysis of randomized controlled trials. Medicina 2016; 52: 28-34. World Health Organization (WHO). Use of Glycated Haemoglobin (HbA1c) in the Diagnosis of Diabetes Mellitus Abbreviated Report of a WHO Consultation. Geneva, Switzerland 2011. Yadav H, Jain S and Sinha PR: Anti-diabetic effect of probiotic dahi containing Lactobacillus acidophilus, Lactobacillus caseiand Lactococcus lactis bacteria in high fructose diet fed rats. Nutrition 2007; 72: 62-8. Bagarolli RA, Tobar N, Oliveira AG, Araújo TG, Carvalho BM and Rocha GZ: Probiotics modulate gut microbiota and improve insulin sensitivity in DIO mice. The Journal of Nutritional Biochemistry 2017; 50: 16-25. Von Wilamowitz-Moellendorff A, Hunter RW, García-Rocha M, Kang L, Lopez-Soldado I and Lantier L: Glucose-6-Phosphate-Mediated Activation of Liver Glycogen Synthase Plays a Key Role in Hepatic Glycogen Synthesis. Diabetes 2013; 62: 4070-4082. Schofield JD, Liu Y, Rao-Balakrishna P, Malik RA and Soran H: Diabetes Dyslipidemia. Diabetes Therapy2016; 7(2): 203-219. Kumar M, Nagpal R, Kumar R, Hemalatha R, Verma V and Kumar A: Cholesterol-Lowering Probiotics as Potential Biotherapeutics for Metabolic Diseases. Experimental Diabetes Research 2012; 902917. Tangvarasittichai S: Oxidative stress, insulin resistance, dyslipidemia and type 2 diabetes mellitus. World Journal of Diabetes 2015; 6: 456-480. Wang X, Bao W, Liu J, OuYang YY, Wang D and Rong S: Inflammatory Markers and Risk of Type 2 Diabetes. Diabetes Care 2013; 36: 166-175. Moore KW, de Waal Malefyt R, Coffman RL and O’Garra A: Interleukin-10 and the interleukin-10 receptor. Annu Rev Immunol 2001; 19: 683-765. Hong EG, Ko HJ, Cho YR, Kim HJ, Ma Z and Yu TY: Interleukin-10 Prevents Diet-Induced Insulin Resistance by Attenuating Macrophage and Cytokine Response in Skeletal Muscle. Diabetes 2009; 58: 2525-2535. Mahajan B, Snehi SK and Singh V: Antidiabetic and anti-inflammatory effect of probiotic Lactobacillus paracasei MCC3195 in high fructose fed type 2 diabetic rats. Int J Pharm Sci & Res 2018; 9(9): 3764-73. doi: 10.13040/IJPSR.0975-8232.9(9).3764-73.